Welcome to the inaugural blog post for Every Food Fits. The idea for this blog came from the desire of likeminded friends and colleagues – Samantha Lewandowski, a registered dietitian, and Stacey Viera, a communicator and photographer – to work together. Sam and Stacey’s mutual love of food – cooking it, eating it, sharing it – was the catalyst for this weekly web log. We hope that you enjoy the mouth-watering photography, prep ideas and sensible nutrition tips we bring to you every Thursday. The best part about the nutrition info and recipe ideas we’ll share? You can enjoy them all guilt free. Remember: Every Food Fits. A recent clinical trial (which is pretty robust as far as scientific studies go) showed that “eating a small, 1.6-ounce bar of dark chocolate every day” can aid heart health, according to WebMD.com. Valentine’s Day is Saturday, so was there any question in the first place that you weren’t going to enjoy some chocolate this weekend? 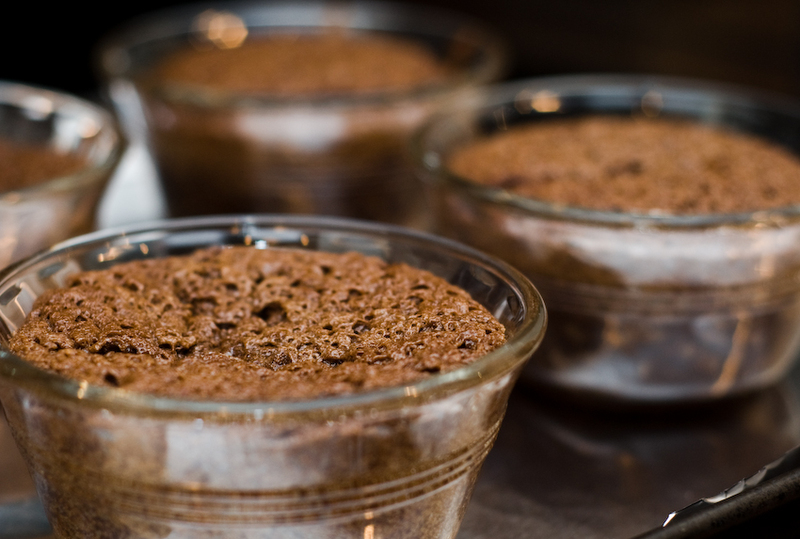 This week’s photo is of Warm Chocolate Puddings – recipe modified from Everyday Food Magazine – which are easy to make and oh-so delicious. Instead of chopping chocolate, Stacey used semi-sweet chocolate chips. One serving of chocolate will likely be between 200 – 300 calories, and will vary depending on brand and ingredients. Finally, each week we’ll reveal “How Stacey got the shot.” For this photo, Stacey used her “Nifty Fifty” lens (50mm fixed focal length) at f/2.8 and bounced the flash off the ceiling. Thank you for joining us for this first posting. We hope that you continue to follow our blog each week. Don’t forget to check out the “About” section to find out more about Stacey and Sam and contact us with any questions. Happy Eating! A new reason to like Thursdays! Great job! I’ll look forward to checking this out every Thursday. Stacey and Sam: Welcome to the blogging community! I’m looking forward to following your posts. Any chance we’ll be getting the recipe for that beautiful warm chocolate pudding? Love the look of your blog and I’m hoping to glean some tips for improving my food photography. Good luck and have fun! Thanks! Hope that you enjoy this recipe! The link to the Everyday Food magazine recipe is in the text. If we link to recipes, it’ll save space on the blog itself. Eat well and be happy!